Hurricane Irene should be thrashing the coast pretty hard come this time tomorrow. As of this writing it's a Category 2 storm: weaker than it had been a day ago but still capable of tremendous devastation. Thoughts and prayers going out to those in the eastern part of North Carolina and the rest of Irene's projected path. 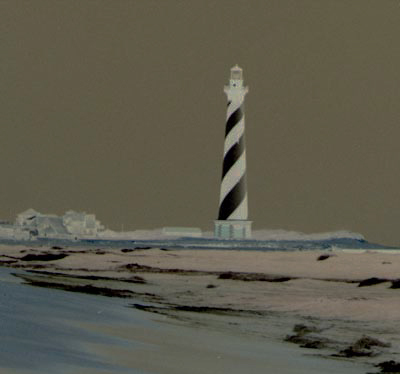 The Gray Man of Hatteras is a ghost reputed to haunt the beaches in the vicinity of the Cape Hatteras Lighthouse. 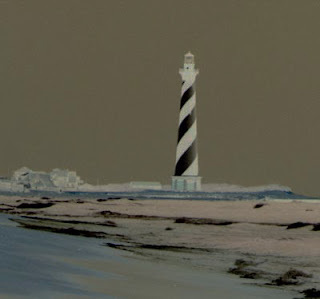 If beaches are haunted then I suppose there are few pieces of coastal real estate with as much merit as Cape Hatteras: more than a thousand shipwrecks litter the waters of "the Graveyard of the Atlantic". Over the past few hundreds of years about as many people have lost their lives to hurricanes that Hatteras - jutting out into the Atlantic like a brawler's jaw daring to be hit - seems to draw unto itself. One of those who are said to have perished was a sailor named Gray, who died in a hurricane off Cape Hatteras sometime in the early 1900s. And ever since, every time that a hurricane takes aim at the Outer Banks, Gray's ghost comes out of nowhere to warn residents and visitors to leave the island... and then abruptly vanishes right before their eyes. I heard that the Gray Man of Hatteras was last seen before Floyd, one of the most destructive hurricanes in recent history, struck in 1999. He is said to have been witnessed before the arrival of every hurricane. Dunno if the Gray Man has been spotted ahead of Irene this week but somehow, I wouldn't doubt it. All the way down to Hatteras from Nags Head there is good karma. Except Rodanthe. There is something dark going on there.